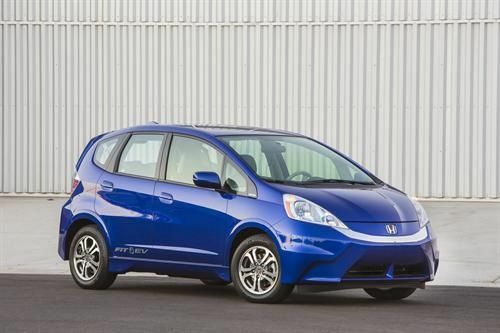 A comparison of the new 2014 Accord Plug-in Hybrid, and the new 2014 Honda Fit EV provides insight to the direction the electric car market is headed. Why sacrifice comfort, convenience, and safety for $1.33 per day? Honda suddenly has both an electric car, the Fit EV, and a plug-in hybrid Honda Accord for sale. When operated as an electric the Accord has an EPA estimated miles per gallon equivalent of 115 mpge. The Honda Fit EV, which looks like an escape pod for an Accord, gets 118 mpge. For that extra 3 mpge the Fit had better come with some serious economic and green-credibility advantages. Otherwise, what’s the point? Let’s take a look at both of these vehicles and see what the world of over 100 miles per gallon (equivalent) is all about. Maybe by comparing the two we will gain some insight into where the green automotive marketplace might be headed. For many years Honda was a fuel economy icon. The company was thought of by customers as a car company that supplied fuel efficient cars. Then someone moved Honda’s cheese. All of a sudden everyone was a fuel economy leader. Toyota certainly, Ford definitely, Hyundai falsely(? ), and many others arguably. So what did Honda stand for if not fuel economy? Honda always prided itself as being a motor company. Indeed Honda had excellent motors. However, with the Passat leading the way with a powerful 2.0 turbocharged, direct injected motor, all of a sudden everyone else had good motors too. Honda was late to the direct injection party which brought better economy and power. Honda was very late to the transmission party too. Only this year has Honda offered a CVT, something Nissan has done for so long we grew tired of disliking it. And Honda’s automatic transmissions seem to be lacking a cog or two compared with many automatic slushboxes. Forget about a dual clutch transmission. Honda isn’t going there. Now Honda has two new cars that are as good on gas as is technically possible in 2013. The Honda Accord, a perennial award winner, huge volume seller, and icon in the car class it defines, can now be partly an electric car. You can plug it in just like an electric car, you can then drive it without using any petroleum distillates for about 13 miles. Let’s say to work. Then you can plug it in there, and drive it home. You won’t burn any gasoline at all if you use it this way. Even better, on weekends you can fill the tank up with some regular unleaded and drive it 574 miles and it will be just like all the other Accords from days gone by. After the 561st mile you can fill the tank and do it again forever, and never have to worry about plugging the car in again if you choose not to. While operating as a gasoline powered car this Accord will get a combined 47 mpg. In case you need a reality check on how amazingly high that mileage is, our editor is presently testing a sporty 5 passenger crossover. His mileage to date in the test is about 15 mpg. Compared to the Accord EX 4-cylinder gas engine with CVT transmission, which sells for $26K, the Accord PIH is more expensive over its lifetime to own, including fuel or electricity. So if there is a buyer out there who is considering this car purely for economic reasons (there isn’t), that buyer should just buy the regular Accord. I know there are readers out there that will now start cloud-computing, using differential equations and Fourier transforms to prove me wrong. Go ahead. I used a green crayon and the back of a stained cocktail napkin and I am certain I am right about this. Buyers of the Accord PIH are going to buy the car because they want to try to do what is right for their planet. Not to save $80 over 10 years. The Honda Fit EV is an interesting vehicle for many reasons. For one, after tax rebates, incentives, bribes, kick-backs, and favors it appears that this car is in the high $24K range in terms of cost. Correct me if I’m wrong, but if that is the case, why are the American Taxpayers “loaning” Tesla and Fisker a half-billion dollars, give or take? Wasn’t the whole point so they could “build an electric vehicle that we could all afford to buy.” Here it is. This little pixie of a car has an MSRP of only $ 36,625. Again Honda wants you to lease it for a while at $389, but they will let you buy afterwards. Take a look at your family budget. Add your cable/internet package and your family's cell phone costs per month together. I will bet you an ice cream that you pay more for those than you will for this car. So again, it is not a stretch to say that this automobile is affordable to most Americans who are shopping for ANY new car of this size. This Fit is a true EV. There are two groups of people in the planet. The first group hears this and says “Thank goodness. I won’t ever have to burn those horrible hydrocarbons again.” The second group says “Cool” and they never think about the car again because they just don’t care. Unlike the Accord PIH, they can’t own this car. They have long commutes, they go places that are more than 41 miles away, and they don’t want to worry about plugging in their car. Let’s just focus on group one. A person considering the Fit EV should know that the gasoline powered Fit is a great car – for its class. I have driven the Fit quite a bit and know that for its target market, urban drivers, relatively free of the need to tow a pair of snowmobiles to the cabin tonight, the car is high quality, affordable in every way, and fun to drive around a city. The EV will likely be all these things and more. The Fit can go about 80 miles on a charge according to the EPA. While it operates it gets 118 mpge. That makes it one of the greenest, if not THE greenest, production car on Earth to drive. We should say at this point that both of these cars are bi-coastal. Like all EVs, Honda is first launching them where the people who might be interested in them are concentrated. That means the two coasts. The rest of you folks in “fly-over” country will just have to wait a little longer to not buy these EVs. Here is the question. For $1.33 more per day wouldn’t you rather have the Accord? It is just so much more car. Ask yourself which you would rather have your child belted into in an accident. And if you are already planning to mostly do city driving anyway, won’t 13 miles on electricity alone be enough for almost all of your trips? This match-up reveals to many the direction the automobile is headed. So many more people can live with the Accord PIH than can live with the Fit EV it seems apparent where the marketplace for green vehicles will mature to. Even if there is a great battery breakthrough (there are announcements every day), wouldn't that help the plug-in hybrid just as much? Honda has just proven that a more comfortable, safer, more flexible vehicle that can usually be operated using no gas is now available for $1.33 per day more than a tiny electric only vehicle. Last sentence needs a decimal point between "$1" and "33". Otherwise, the Accord PIH is outrageously expensive! Interesting comparison. Agree that driving habits will ultimately influence BEV vs. Hybrid decisions. One minor correction is the Fit EV will not be available for purchase at lease end. Too bad as the Toshiba SCiB batteries can provide up to 6,000 charge cycles, which should last as long as the Fit EV. The comparison with 26K Accord is not correct. The PHEV comes fully loaded with Navigation, LWD, dynamic cruise control, ... So that compares to an EX-L Nav which is 30K (but in addition has the dynamic cruise control minus leather). Now figure a federal rebate of 3750 plus 1500 from CA and difference is less than 5K. Then compare the EPA ratings of 27/36 mpg compared to 47/46 mpg and it would payoff for some people for sure. i disagree on the fit. i have a gasoline one and it is a better buy in every way. it is much more fun to drive. With the Magic seats and hatchback, it is much more versatile. It's safe record is tops with an integrated steel rollover crush resistant frame and six air bags. i don't see how you can talk down the fit like it's a tin can!